Dude manages to squeeze in twitter stalking, the Mothman, telepathy, extra terrestrials, UFOs, alien mind control, the downside of the “alien defense angle” in the court system, and the apparent uselessness of psychotropic drugs on “alien mind control” into 3 minutes and 6 seconds. 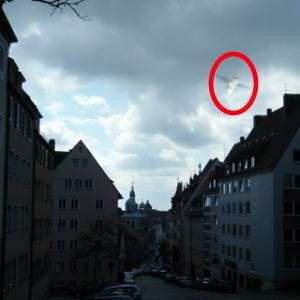 A York woman discovered the following image in her photos from Nuremberg, Germany. Abbey has shown the picture to friends and family, including a photography student, and nobody has yet come up with a clear explanation. “I thought it looked like a cherub,” said Bev, Abbey’s mother. 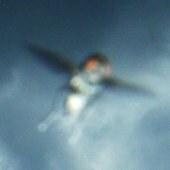 Many have pointed out that the image look very much like West Virginia’s famous Mothman. Has the MM migrated? Or maybe, like the woman who photographed him, he was just on holiday? You are currently browsing the archives for the Mothman category.